Moree Gun Club President Stuart Boydell, left, Treasurer Terry Haynes fires targets for Adam Marshall during the MP’s visit to the club to announce $10,120 in funding from the program last year. MEMBER for Northern Tablelands Adam Marshall has today encouraged gun clubs and sporting shooters groups from across the region to apply for funding from the NSW Government’s Safe Shooting Program before applications close on 13 October 2017. Mr Marshall said the main aim of the program was to increase the safety at shooting facilities across the state as well as during club sponsored activities held away from a club’s permanent base. He said that incorporated, community based not-for-profit shooting, hunting or collecting clubs could apply for up to $20,000 per project. “The types of projects that attract funding can include upgrades of firearms, refurbishment of ranges, new amenities blocks, canteens, capital equipment and facilities to comply with WH&S legislation,” Mr Marshall said. “The construction of new fixed and portable facilities and infrastructure or the enhancement of existing facilities will also meet the criteria for funding as well as the development and delivery of training programs to improve safety and compliance. 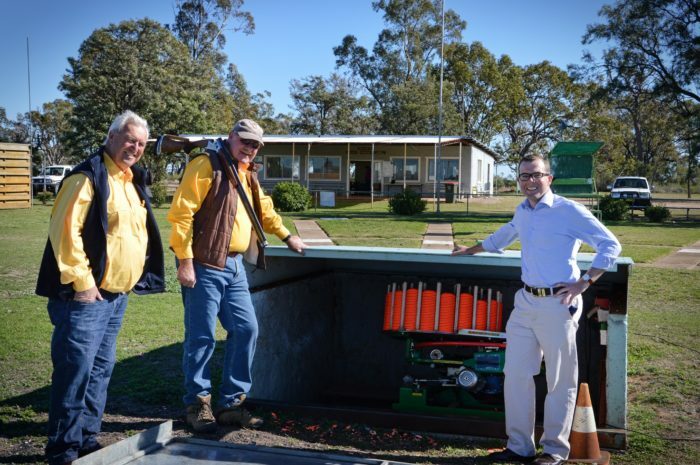 Mr Marshall said four Northern Tablelands shooting clubs and associations received more than $39,000 in grants last year to upgrade their ranges and improve their security systems. “I had the pleasure of visiting all four sites last year – the Armidale Rifle Club, Inverell RSM Pistol Club at Delungra, the Moree Gun Club and the Emmaville Shooting Range – they’d all received substantial grants to improve the safety standards of their sites,” he said.